The Dell UltraSharp UP2715K is a 27-inch monitor with a 5K or 5120 x 2,880 resolution meant to be a Retina Display alternative. This flagship display from Dell boasts of impressive imaging specifications to go with its fantastic resolution elegantly wrapped in a sophisticated design further perfected with the audio expertise of Harman Kardon. We are spoiled with a plethora of premium monitor choices in today’s vast market, but it is rare to see products with price tags and technicalities in this range, so let’s check out if the Dell UP2715K is worth its cost plus an upgrade to a suitably powerful graphics card to run 5K content. The Dell UP2715K sports the company’s favored black and silver color scheme on its exterior, but what makes this model extra special is its edge to edge glass design. There are virtually no bezels on the face of this product, making your view of the gorgeous 5K screen unobstructed. Not a lot can be said about Dell’s preference for its svelte matte black cabinets, but this is one of the facets which make their products popular with a large crowd who believe in the “less is more” concept. Even their gaming model, the S2716DG and S2417DG are preferred by gamers against the gaudy designs of other brands. The OSD and power buttons are located on the right-hand side while the card reader with support for various memory types is on the opposite, making the UP2715K’s face cleaner than most models. This model also comes with a multitude of I/O options on its back, but the stand out feature in the layout is the dual DisplayPort receptacles. To operate at 60Hz 5K, you need to utilize a dual DisplayPort connection, so a high-end graphics card or two comes into play. There is also a total of 6 USB 3.0 slots for peripherals on the UP2715K, including a port of up-streaming and another one with power charging capability. Built-in speakers in most monitors almost always sound like rattling cans, but the 16-watt Harman Kardon pair on the UP2715K is surprisingly pleasant on the ears. Its audio capabilities are probably possible through the 16 watts of power the set provides since most alternatives only go from 2 watts to 7 watts at the most. Bass response is also more than decent, so your listening needs will be fulfilled while working or your personal movie time will also present an improved aural experience. 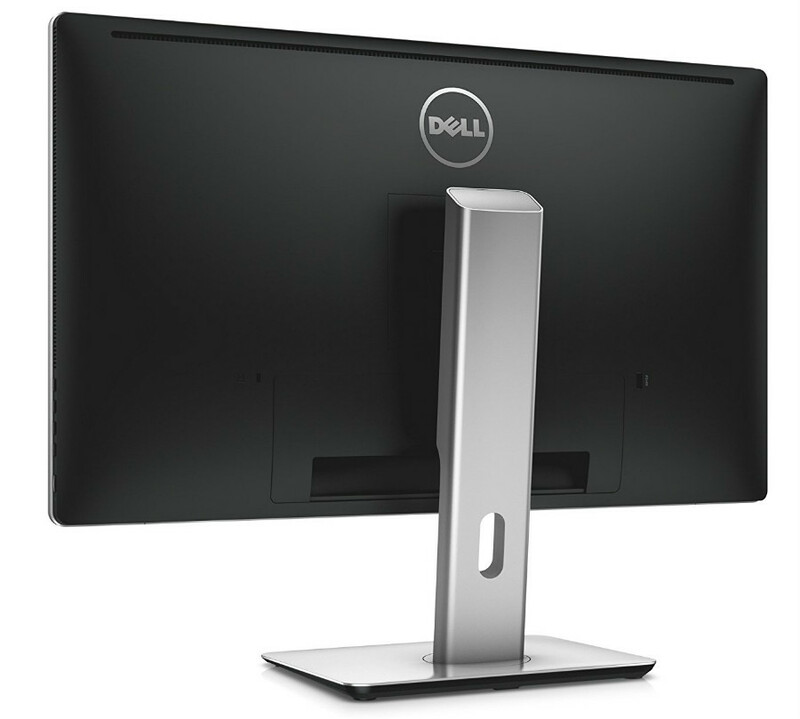 To hold all these excellent features in place, Dell includes their standard mechanical stand which executes its ergonomics superbly. There are adjustments for tilt, pivot, and swivel, plus you can also raise the display up to 4.5 inches more. The silvery neck also has a cable tidy hole to hold your wires in place, and we suspect you are going to use this feature since the UP2715K’s full operation requires a plethora of connections. The Dell UP2715K boasts of an exhilarating 5120 x 2880 resolution with a pixel density of 218 which provides an excellent and unrivaled amount of detail for 5K content. Pixel pitch is also impressively minuscule at .116mm, making them almost invisible, much how the Retina Display’s main selling point works. 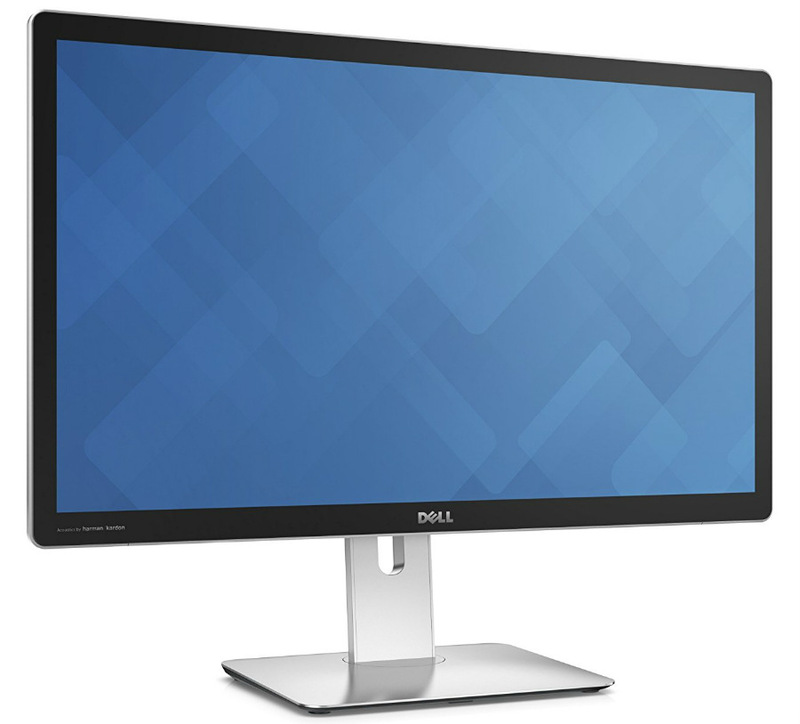 Dell advertises the UP2715K to be capable of 99% Adobe RGB and 100% sRGB coverage out of the factory, and our tests prove that this monitor is indeed color accurate. Each color is near their ideal points in our color tests, while grayscale performance is as expected from a high-quality IPS panel with a 10-bit interface and a 12-bit LUT. Shades and shadows were displayed accurately while blacks are thick and oily since our test model did not have any issues in uniformity or backlight bleeding. Just by viewing 5K sample images alone either in a dark or fully lit room, Dell’s superb quality control and manufacturing processes become instantly apparent on this beautiful 5K IPS panel. There are eight color presets to choose from which includes sRGB and Adobe RGB modes, which in our book already maximized the capabilities of the UP2715K for photo editing, but meticulous users can further calibrate this model with the use of an X-Rite iDisplay Pro colorimeter while using the company’s calibration software. The biggest downside of the Dell UP2715K is its slow 8ms response time. While not excruciatingly debilitating for casual gaming experiences, we did see minor ghosting in our Battlefield 1 test. Although, the main issue for gamers with this model lies in the GPU dilemma. Primarily, 5K operation requires dual DisplayPorts, and currently, only a few top-end cards offer this port layout. It is also impossible to maximize or optimize high graphics settings at 5K with any video card since the 14 million pixels in the UP2715K requires an incredible level of GPU power. Take note that this is not a gamer-centric model, so there are no included Adaptive Sync technologies to help you with stuttering or tearing. You can opt to use two GPUs in Crossfire or SLI, but that would raise your total build cost and energy consumption significantly, making it an unpractical solution. The Dell Ultrasharp UP2715K is an excellent 5K monitor worthy of its hefty price tag due to its stunning 5K detail and color performance for any situation it encounters in your hands. The exterior design and included features are robust and excellent. Its main caveat lies in the GPU requirements for running this bad boy for your workstation or home; you need a dual DisplayPort card or SLI/Crossfire setup to activate 5K at 60Hz. GPU Processing power requirements are also at unimaginable levels, so you might need dual GTX Titans to run games smoothly at 5K for AAA titles. Although the Dell UP2715K is mainly intended for photo editors or video professionals, there are some enthusiasts out there who are looking for an out of this world display for their enjoyment. If your setup is slightly lacking, you can settle for 4K at 60Hz with a single DP connection, but you’re better off investing as little on a cheaper 4K IPS gaming monitor such as the PG27AQ, for only more or less half of what this high-end product commands for ownership.